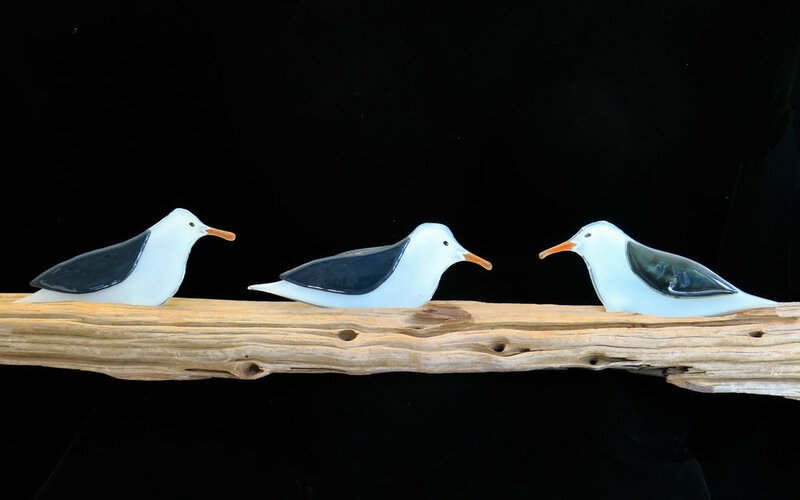 Rhondda has been involved with art and craft in some form for most of her life, starting back in the early sixties when she was introduced to pottery and ceramic sculpture by her mother. Ceramics was a continued and evolving learning experience for Rhondda until about 20 years ago when she took a complete change of direction and learned the arts of kiln-forming glass and glass bead making. Rhondda continues to work in this medium in the present, creating both functional and decorative works and often a crossover of the two. Her interests these days are tending towards sculpture and more artistic glass pieces and more recently to bone carving and cold-connection copper jewellery making. In 2014, Rhondda’s daughter Kate returned home from overseas and took an interest in the glass-making process, learning the technique from Rhondda and applying her own aesthetic to a new line of kitchen and home-wares co-designed by the pair. Together they now work to bring exciting, new and contemporary designs to life in their glassware lines, while continuing to create unique and colourful jewellery in a range of mediums.